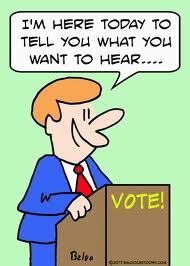 A politician is one who aims to occupy an elective position. And the requirement is that, he should be a leader. (Now a days, it counts to be popular, hence, even those in show business while before were crowd drawers and endorsers, have decided to throw their hats into the fray.) It is not a problem though if they have the temperament and the courage to mix it up as a true leader. Now, a leader may take several projections. He may be a scholar and therefore may be an effective leader in the academe. He may be firebrand and may lead a group towards a cause. He may be a proficient and a skilled practitioner of a specific calling and may lead a group of professionals towards a mission. In other words, he must be some kind of a beacon, a flash of guiding light whence everyone benefits from its illumination. Once I tried to imagine myself to be a politician also. I thought I could make a difference. I could represent what has been the prevailing sentiment of the collective. I could lead and pave the way towards a happy solution to whatever problems, social ones, and like any activist placard could proclaim, make our society great. For quite a time I thought that politicians, which I intend to mold myself, could champion those who never made it in the bar and board exams. And why not. In India, those who graduate from the law school are immediately eligible to defend their clientele as lawyers without undergoing what we have here as a requirement like passing another layer like the Bar exams. The same can be said about the board exams for other professions like the medical, architectural, engineering, etc. I could just imagine how fulfilling to have a number of lawyers, doctors, architects, engineers, etc. we could expect from thousands of those who graduated from our colleges and universities applying and practicing what they have learned in school. Let us cut the crap as far as these qualifying exams are concerned. Some sectors are making money out of the frustration of the majority. We encourage failure more than sustain a profession. We even rejoice at the victory of some and elevate them on the pantheon of elitism to the disadvantage of the greater majority. We abhor discrimination but all our system seems to be geared towards it. We despise alienation but we have enough rules amplifying it to a large extent. We pray for unity but all that we try to promote, well those formal situation we oftentimes find ourselves, are pure divisive in essence. Well, that is just for starters. Leadership is everything about concern. If I find a beggar in the street, I would immediately presume that the politician of that place is incompetent. If there are squatters or informal settlers in a specific area, there is no progressive leader operating therein. If there are more unemployed people restlessly plying here and there, the leader is never trained in economics. If the area has no business climate, I would organize one and compel the public sector to pursue several commercial projects. The political leader must have the sensitivity and wisdom that matters in his sworn duty. He must be everywhere and must have the competence to be knowledgeable on that which affects his turf. I am not arguing from the point of view that a leader should be a polymath like Leonardo da Vinci or anyone approaching the status of a genius but there are a number of specialists, concerned ones at that, who can be tapped. If only leaders would act like one and not as someone with a limited persuasion like accumulating powers, influence and name all for the sake of selfish interests. Politics will regain its pristine principle in guiding his entire constituency in developing his area to be self-sufficient and disciplined to the core. However, I can only dream to be one. Posted on November 11, 2012, in Uncategorized and tagged bar exams, board exams, current-events, leadership, politics, skilled practitioner. Bookmark the permalink. 1 Comment. Useful tips. Hope to determine more great posts in the future.